Accepta 2551 is a high performance, very low foaming non-ionic dispersant scientifically formulated for the removal of microbiological build-up, debris, slimes and biofilm in cooling towers and cooling water systems. 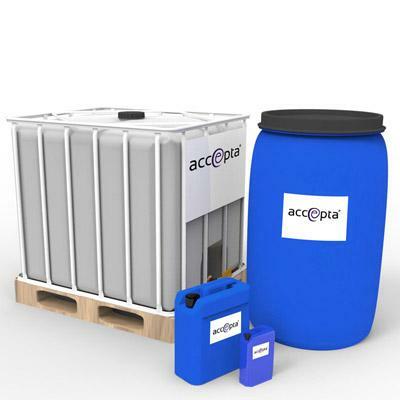 Accepta 2551 has the benefit of being extremely low foaming and is especially effective for the treatment of cooling water systems when used in conjunction with a microbiocide. Accepta 2551 is stable over a wide pH range. Accepta 2551 is not a biocide. Typical dosage rates for Accepta 2551 when dosed continuously are 1 – 2.5ppm. The dosage rate of Accepta 2551 will depend on the level of system contamination. When “shock dosing” a badly contaminated system apply a heavy bleed-off. Always remember that biofilm may contain Legionella bacteria. Accordingly, you should always use Accepta 2551 in conjunction with a suitable biocide. Closed systems must be flushed thoroughly with fresh water. Accepta 2551 is compatible with most cooling water treatment products. For further technical assistance concerning Accepta 2551 please contact Accepta.